The Library is on working on Semester 2 Resource Lists and we hope to have all lists completed before the festive break. There are now approximately 1800 resource lists published for courses offered in 2018/2019. 1.If you have been editing your list and would like the Library to purchase any new or additional books or ebooks or provide any copyright compliant scans, please remember to use the ‘Send List’ button at the top of your list. If you don’t send your list, we won’t take any action. Please note, if you’ve not made any changes to your Semester 2 list or don’t want the Library to take action, you don’t need to send your list. Course administrators, if you are aware of any changes to courses or Course Organisers, please let us know. 3. Finally, please make sure you enable the link your list on your Learn course– this is how we expect students to access their Resource Lists. 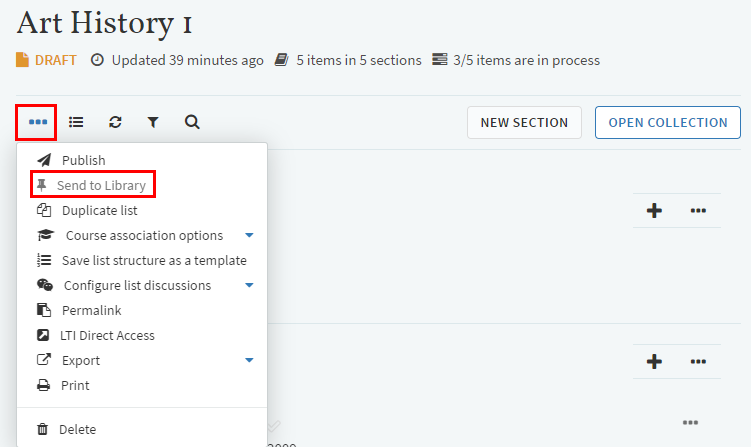 There is a ‘Resource List’ link on the menu in Learn, this is not visible to students unless you make it visible. You can use ‘student preview’ mode to check you’ve enabled the link to your resource list, you’ll be able to follow the link in the menu and see the Resource List link and icon in the content area. NB you won’t be able to link through to the resource list in student preview mode (this is expected behaviour) but as long as you can see the link, it should be working. This entry was posted in Uncategorized on December 6, 2018 by alaurins. We will still build new lists and review lists beyond these dates, but may not be able to guarantee that new purchases will arrive or scans will be ready in time for the start of semester 2 teaching. Course organisers, If you would like the Library to provide a Semester 2 Resource List, please send us your annotated list using the online form https://edin.ac/resource-list-request-form by Monday 22nd October. Alternatively, if you’re working on your Semester 2 Resource List yourself, please publish and use the ‘Send List’ button to request a review by Monday 29th October. Remember to prioritise items on your list using the ‘Essential’, ‘Recommended’ and ‘Further reading’ tags. To request e-reserve scans, use the ‘Digitisation’ tag and ‘Library discussion’ to provide page numbers or chapter details of pages you’d like scanned. We’re also running some bookable workshops throughout October. These sessions rarely last the full two hours and are an opportunity to refresh your knowledge of Leganto and ask us any questions you have about Resource Lists and/or Leganto. Please contact Library.Learning@ed.ac.uk if you have any questions about Resource Lists or would like to arrange a school-based information session or workshop. This entry was posted in Uncategorized on September 25, 2018 by alaurins. The deadline for sending your reading lists to the Library is fast approaching. Course organisers and tutors, send us your lists using the online form by end of Monday 9th July. As well as converting your current reading list to an online Resource List using Leganto, we’ll check all current library holdings, process any new or additional purchases, provide e-reserve scans and move items to HUB/Reserve. The ISG website also has details on how the Library is using Resource Lists to manage the provision of key reading materials. Building your own resource list? If you’re building your own lists for 2018/19, remember to use ‘Send List’ to send the list to the Library for review by 23rd July. There is a 10 step guide to using Resource Lists to help you get started. Deadlines for Semester 2 will be circulated in October. However, if you have a semester 2 list ready, we are happy to start working on it sooner rate than later. This entry was posted in Uncategorized on July 6, 2018 by alaurins. Library Learning Services is running a series of resource lists workshops throughout June and July . All workshops will be held in Room EW 10, Argyle House. Alternatively, have a look at the workshop presentation and Ten step guide to getting started with Resource Lists or find out more about the Resource List service on the IS webiste. This entry was posted in Uncategorized on June 4, 2018 by alaurins. We now have 1200 published Resource Lists for the start of Semester 1 2017/8 and are already working on Semester 2 Resource Lists. If you would like the Library to build your Semester 2 Resource List, please send your annotated list with a completed coversheet to library.learning@ed.ac.uk by Tuesday 17th October. (If you have a Semester 2 list ready, please send it now and we’ll start working on it before the deadline). Alternatively, if you’re creating your Semester 2 Resource List yourself, please publish and use ‘Send to library’ to request a review by Monday 30th October. Remember to prioritise items on your list using the ‘Essential’, ‘Recommended’ and ‘Further reading’ tags, and to request e-reserve scans, use the ‘Digitisation’ tag and ‘Library discussion’ to provide page numbers or chapter details of pages you’d like scanned. Please contact Library.Learning@ed.ac.uk if you have any questions about Resource Lists or would like to arrange an alternative training session. This entry was posted in Uncategorized on September 25, 2017 by alaurins. It’s the start of semester and all Semester 1 lists are published – we’re now working on Semester 2 lists. However, we’re hearing that some students are having issues accessing their lists via Learn. While we do some investigating, there are workarounds in place. If you’re still having problems, you can log in through the homepage (http://resourcelists.ed.ac.uk ). 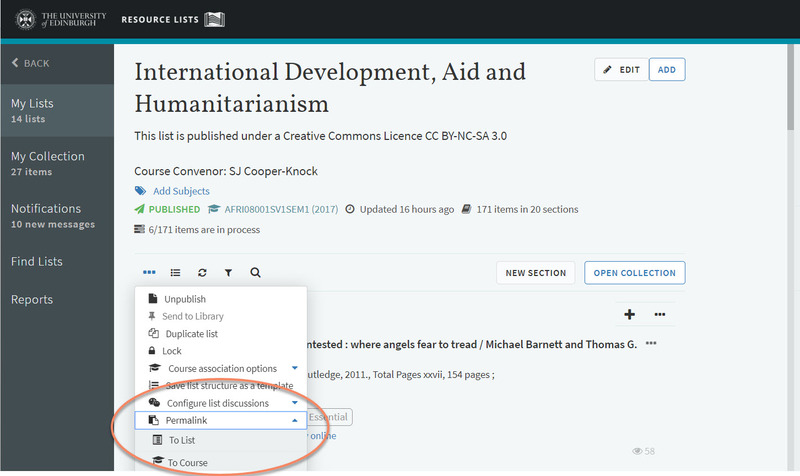 You need to make sure and sign in to have full text access to resources (go to ‘Guest’ top right of screen to log in). If you’re still unable to access Resource Lists, we can check your Library account is set up correctly – if this is the case, drop us a line (library.learning@ed.ac.uk ) with your details and we’ll investigate. Please keep an eye on the Resource List blog (http://libraryblogs.is.ed.ac.uk/resourcelists/ ) and/or follow us on Twitter @ResourceListsEd for regular updates. This entry was posted in Uncategorized on September 20, 2017 by alaurins. You can generate a permalink for your Resource List which you can then add to a web page or document. Don’t copy the link in the browser address bar. Instead, go to the ‘Reading Lists’ option menu (…) at the top of your list and select ‘Permalink’ from the drop down menu. You have the option to create a permalink to your list here. This entry was posted in Uncategorized on September 19, 2017 by alaurins. Resource Lists- remember to sign in! If you’re using Resource Lists via the Find lists homepage: http://resourcelists.ed.ac.uk and you’re having problems accessing resources on a Resource List, check if you’re logged in. If you see ‘Guest’ in the top right of the screen you’re not logged in! If you’re a ‘Guest’ you can still see the list but you won’t be able to click through for full text access. Click on ‘Guest’ and use your EASE details to sign in. When you see your name, you can start using Resource Lists and should be able to access all the resources on your list. This short guide will show you how to edit, move, and delete your citations and/or sections within your list. 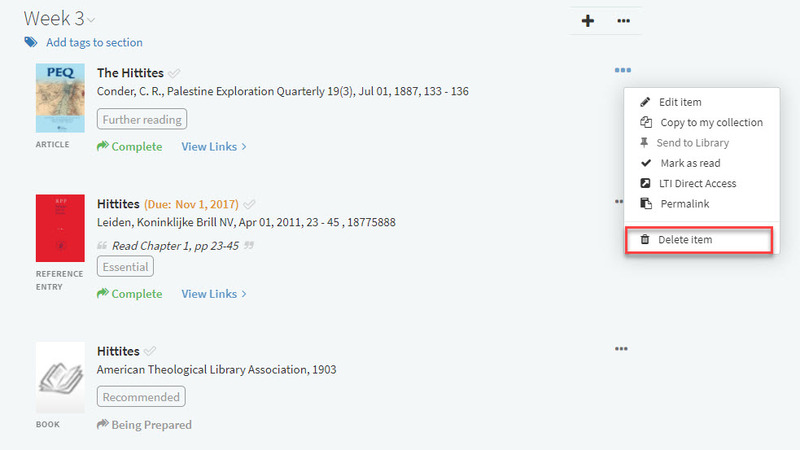 By clicking on the menu (the “…” icon on the right of the citation) and choosing the “edit item” option. You can add additional information about the item record in the pop-up. Clicking on the citation displays the full item record, which you can easily edit to add notes for students or a note for the library. Moving your citations around is easily done with just dragging and dropping them. Useful tip: if you experience problems, refreshing the page may help. on the “…” icon on the rig ht of the citation). Useful tip: If you would like to delete the item from the section, but you might want to use it again some time later, save it to your “My Collection” and you can easily find it again when needed. Click on the menu (the “…” icon on the right of the section’s title), and then choose the “edit section” option. Don’t forget to hit “Save” after changing something on your list. This video will demonstrate how to move your sections within the list. Useful tip: if you are having problems with dragging and dropping the sections, refresh the list, or the whole page. You can copy sections within the same list, or you can even copy sections into as many other lists as you wish. The video below will show you how. The way you delete a section is very similar to deleting an item. Click on the menu (“…”) on the right of the section’s title, and then choose the “delete section” option. NB if you delete a section or a list, you can’t recover it, so be careful! This entry was posted in Uncategorized on August 23, 2017 by alaurins. A wee reminder that if you’re building your Resource list using Leganto and you’d like the Library to order books, provide scans of chapters of move books to reserve collections, please send the list to the library for review by Monday 24th July. 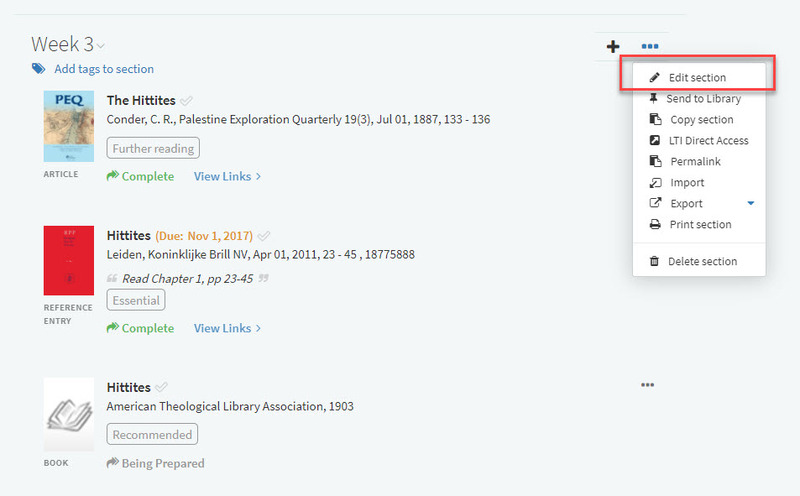 When you’ve completed your list in Leganto, click on the three dots (reading list options) at the top of your list and select send to library. You’ll find more help on using Leganto in the Getting started guide. 24th July is the deadline for Semester 1 courses. We’ll issue new deadlines for Semester two in September- so plenty of time to think about using Leganto for Semester 2 courses. This entry was posted in Uncategorized on July 17, 2017 by alaurins.